Thanks to Tokenblack03 for the info! Mixed In Sheffield released some remixes of the classic "We Don't Need This Fascist Groove Thang"
Heaven 17 have been confirmed as special guests on Later With Jools Holland. The programme will be transmitted LIVE on Tuesday 19th at 10.00 p.m. on BBC2 and the pre-recorded programme will transmit on Friday 22nd October at 11.45pm on BBC2. Heaven 17’s appearance on Jools Holland will precede the highly anticipated 30th Anniversary tour of their seminal album "Penthouse And Pavement". It will be the first time the band will perform the album in its entirety. The tour includes the following dates: Edinburgh Picture House (Nov 22), Glasgow 02 ABC (Nov 23), Manchester Ritz (Nov 25), Birmingham HMV Institute (Nov 26), London HMV Forum (Nov 28), Oxford 02 Academy (Nov 29), Brighton Corn Exchange (Nov 30) and Bristol 02 Academy (Dec 1). The UK tour coincides with the "Collector’s Edition" of Penthouse And Pavement, released by EMI Records as a 3-disc set. CD#1 includes the digitally re-mastered edition of Penthouse And Pavement. CD #2 includes previously unreleased demos from the Penthouse album, plus never-before-heard tracks. The 3rd discs is a DVD which includes the Penthouse And Pavement promotional video and The Story Of Penthouse And Pavement: 2010 Documentary (1 hour). BlinkTV will release a 2-disc DVD package called “Penthouse and Pavement Live in Concert” on November 15th. The concert was filmed in the band's hometown of Sheffield earlier this year, and is shown in its entirety for the first time. The package will also feature a special extended edition of the documentary, "Heaven 17: The Story of Penthouse and Pavement" that will include exclusive new footage of the band. H17 are interviewed “live” on the Funk & Soul Show from 8-8:30pm on BBC 6 Music on Saturday October 2nd. Martyn Ware and Glenn Gregory will do a face to face in-studio interview with Craig Charles in London. H17 are mentioned on the BBC 6 Music web page here – http://www.bbc.co.uk/programmes/b0072ky7. Listen Online. The band’s interview on BBC Radio 2’s Radcliffe & Maconie Show will now air on Wednesday October 6th at approximately 9:10pm. H17 are mentioned on the Radio 2 web page here - http://www.bbc.co.uk/programmes/b006wr8d/episodes/upcoming. Listen Online. 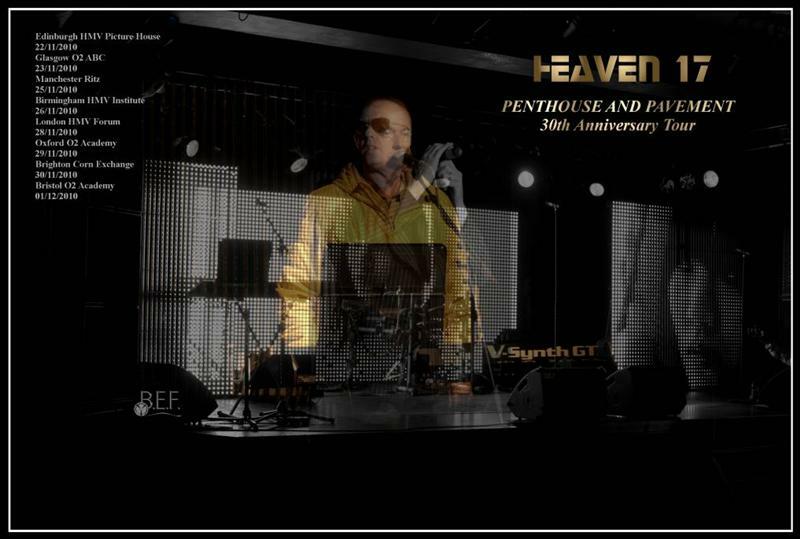 Both interviews will discuss Heaven 17’s forthcoming “Penthouse And Pavement” UK Tour which starts on November 22nd, and the release of “Penthouse And Pavement: The Collector’s Edition” a 3-disc set that will released on November 22nd by EMI Records. Brothers, sisters, (We Don’t) Need That Fascist Groove Thang! 26Sep2010 Updated some details of the "Endless" release from 1986 and some chart positions and added some articles from 1983 to 1984. See TEXT INFO / TEXT COLLECTION / 1980-today. Have you seen Martyn Ware's blog? 13May2010 BBC2 sendet eine Doku über Heaven 17. In addition, tickets for the UK Penthouse & Pavement tour dates in November go on sale on Wednesday 12th May. New series of live gig announced, see tour page for details. 29Apr2010 Neues Konzert im Rahmen der "Back to the 80's"-Reihe im Harewood House Leeds. Details siehe Tour Infos zu 2010. Dank an David Riley für diesen Hinweis. New live appearance Harewood House Leeds. See Tour_info / 2010. Thanks to David Riley for this information. 13Apr2010 http://www.heaven17.de/heaven17.xml ist der seit Kurzem vorhandene RSS-Feed, auf dem ich parallel zu dieser Seite Änderungen und ggfs. auch echte Neuigkeiten verbreiten werde. Wegen der ziemlich garstigen Regeln bzgl. unverlangter EMails in unserem Lande, werde ich keine Email-Verteilerlisten (mehr) nutzen. Diesen RSS-Feed erstelle ich von Hand. Bitte nicht beschweren, wenn mal was nicht auf Anhieb funktioniert, Danke ! To receive site updates you may use the new RSS-feed http://www.heaven17.de/heaven17.xml. I will not/no longer send any emails due to restrictions in German law concerning unwanted mails etc. The RSS-feed will be manually created and experimentally. Please do not complain if something is not working properly, Thanks! 13Apr2010 Da dies eine Seite auf einer .de-Domain ist, denke ich, werde ich künftig Teile auch in Deutsch darstellen. 30Mar2010 Put some pictures of the concert of March 30th on the page. See Multimedia / Live_Photos / Aschaffenburg for the details. 15Mar2010 Finally managed to put some pictures of the concert of March 6th on the page. See Multimedia / Live_Photos / Magna_Sheffield for the details. Hey, I'm just writing to let you know some exciting Heaven 17 news; Martyn and Glenn are coming on board our upcoming, brand new sci-fi comedy musical series The Cabonauts to remix some of the tracks featured in each episode. The Cabonauts stars Nichelle Nichols (Star Trek's Uhura) as the CEO of a cab company and playing the roles of the passengers are actors/actresses from iconic sci-fi TV series and movies. Each episode comes with an original track of music that the entire cast sings and dances in - and because the show is set in the 80's (the 2180's!) the songs are dancey slabs of electropop. 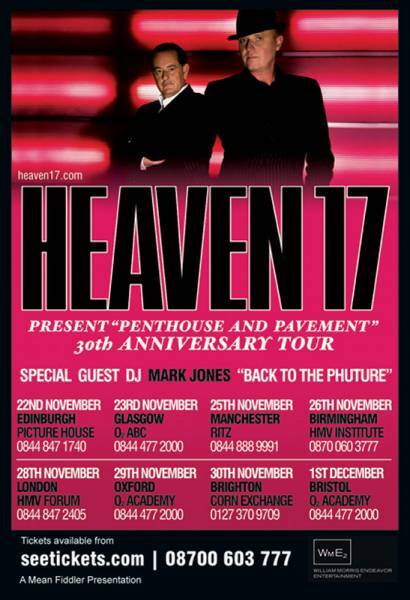 Coming on board to do remixes so far are Jo Callis (Human League, Rezillos),Muchuu and now Heaven 17 themselves! You can follow the goings-on via the twitter account @TheCabonauts - and you can see the site at http://www.thecabonauts.com. 19Feb2010 WWW.HEAVEN17.DE moved to Celeros Online as webspace provider. Thanks to Freedoms for the years of hosting these pages. 17Feb2010 Tried to remove all the missing or broken links, sorry, a lot of information got lost in the last years because people closed their homepages. Justmusic www.justmusic.co.uk announces: "...see you soon with some interesting and exciting news on Glenn Gregory - he of Heaven 17 and Honeyroot fame..."
29Jan2010 Magna concert March 6th at "The Star"
29Jan2010 Big news on the pages of "The Star"!!! Electronic music expert Mark Jones hosts a special edition of the 6 Mix celebrating 6 Music bringing La Roux and Heaven 17 together for a unique musical collaboration. In the first hour of the show, Mark goes 'Back To The Phuture' with Heaven 17's Martyn Ware, talking about his musical upbringing in Sheffield and playing tracks which inspired him from Wendy Carlos, Frank Zappa and Kraftwerk. In the second hour of the show there's a guest mix from La Roux, with frontwoman Elly Jackson picking and talking about tracks with have inspired her including music from Japan, Yazoo and The Knife.